"East" Crater, RIP (Rest in Peace) - Long Live "Little West"
Corrected Transcript and Commentary Copyright © 2009 by Eric M. Jones. Last revised 28 November 2010. Late in the EVA, at about 111:10:49 Neil ran out to a 30-meter crater about 60 meters east of the LM. This is the crater he mentioned during the final descent at 102:44:25. The following map was produced by the USGS and The Defense Mapping Agency for NASA. Although it bears no date, Mary Ann Hagar at NASA's Lunar and Planetary Institute tells us that their catalog indicates an approximate publication date of 1978. By the time the map was prepared, the crater had been named Little West Crater because of its proximity along the flight path to West Crater, the far larger, football-field-sized crater Neil was forced to avoid following pitchover and described later, at 102:55:16.
with the 30-m crater east of the LM bearing the name "Little West Crater". For some years, this crater has borne the name "East Crater" in the ALSJ and various derivatives. My memory is that I had seen that name on maps available to me in the early 1990s, but a search in 2009 failed to turn up any such maps. I now believe that, in preparing the A11LSJ, being unware of the "Little West" name, I simply got tired of writing "the 30-meter crater east of the LM" and started using the name "East Crater". The earliest version of the Apollo 11 Image Library available via the Wayback Machine is dated 17 June 1997. The name I used at that time was "East Crater". The first appearance of "Little West Crater" is 12 May 2006. 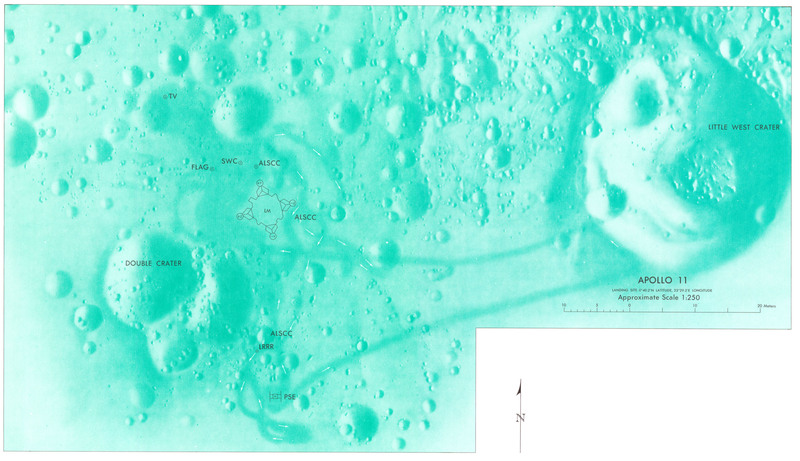 In an exchange of e-mail, Philip J. Stooke, author of the comprehensive International Atlas of Lunar Exploration, confirmed that his own searches of the source material have not unearthed any use of "East Crater" outside the ALSJ and its derivatives. Consequently, I have removed all uses of "East Crater" from the Journal.